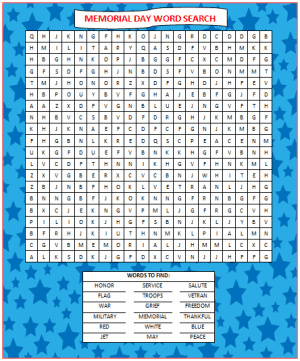 This free printable Memorial Day Word Search is a fun activity for children that could help them learn a little bit more about Memorial Day or help to spark some Memorial Day conversations with you. Click here to access the free printable game. Do your children know what Memorial Day means? You can discuss the meaning of Memorial Day with your kids while working on this free printable word search. It’s a great way to spend some family time together while learning about special days and celebrations. The searchable words are listed on the free printable. How many of these words can you find? Looking for more fun ways to celebrate Memorial Day? Here are some Memorial Day activities for kids. How does your family typically celebrate Memorial Day? Do you do fun crafts? Do you attend a special service in your city? Do you plan a family BBQ party at home? Is this the first weekend you go out camping for the year? Let us know in the comments below and perhaps inspire some other families out there to create new Memorial Day traditions. Did you know that Moms & Munchkins is full of free printable games? Simply visit our Printable Games page for a listing of all the games. We have word searches, scavenger hunts, trivia games and our most popular section – charades! Moms & Munchkins also has a page dedicated to holiday fun. On our Holiday Fun page you’ll find activity ideas for all of the major holidays plus some of the little-known silly holidays that are perfect for celebrating with little ones. You can also follow us on Facebook to keep updated on the latest freebies offered to our readers.